Completed membership forms can be dropped off at the Church on Sundays until 1:00 pm or left with any member of the Parish Council. 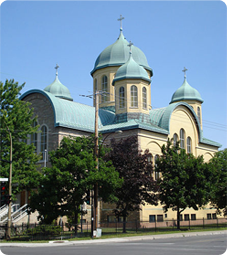 Join us for fellowship coffee every Sunday in the Parish Hall following the Divine Liturgy. For further information about membership, please contact Fr. Volodymyr at (514) 727-2236 or e-mail him at kouchnir.volodymyr@gmail.com.